Dunk-a-Roos is a product from Betty Crocker (General Mills). It was first launched in 1988. It consisted of a snack-sized box that contained kangaroo-shaped cookies and either chocolate or vanilla frosting used as a dipping sauce. The cookies, which are cinnamon, honey graham, or chocolate chip in flavor, are meant to be dunked into the frosting before eaten and come in different shapes (biplane, bicycle, hot air balloon and the mascot's head). Usual frosting flavors include chocolate (with chocolate chip or honey graham cookies) and vanilla (with cinnamon cookies), and vanilla can also contain rainbow sprinkles. Individual snack packages contain about ten cookies and a cubic inch of frosting. They feature a Kangaroo mascot on the boxes, each box contains 6-individual packages of frosting and cookies which contain the nutritional facts on the cover. They are rarely seen in advertisements, though they are sold in locations such as Costco, Dollar General and Shaw's. As the product grew in popularity, in 1995 a new flavor, "Cookies 'n Cream," was introduced, which allowed the consumer to make his or her own cookie wafer sandwiches. The Shrek Edition Dunk-a-roos featuring green frosting were released soon after the movie (Shrek) itself. The product's mascot was originally a kangaroo who wore a green hat, a green vest, a striped tie, and spoke with an Australian accent. 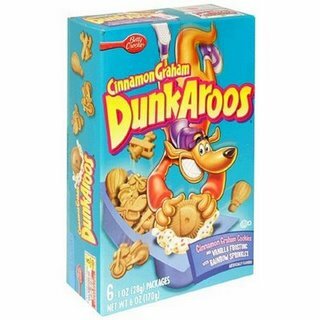 In the fall of 1996, the company decided to change the mascot and initiated a contest known as "Dunk-a-Roos Kangaroo Kanga-Who Search," allowing children to submit drawings of possible designs. The winner, introduced in January 1997, was "Duncan the Dunking Daredevil"; in his commercials, he'd attempt a daring stunt to dunk his Dunk-a-Roos but would always fail. Dunkaroos are still available in certain areas of the Canadian and American marketplace, but only two flavors (cinnamon cookies with vanilla sprinkle frosting and honey graham cookies with chocolate frosting) are still made.